A Georgetown University law student filed a class action lawsuit against the school, Kesher Israel synagogue and the National Capital Mikvah over allegations an Orthodox rabbi secretly recorded her during a ritual bath on two occasions in the spring, the News4 I-Team learned. 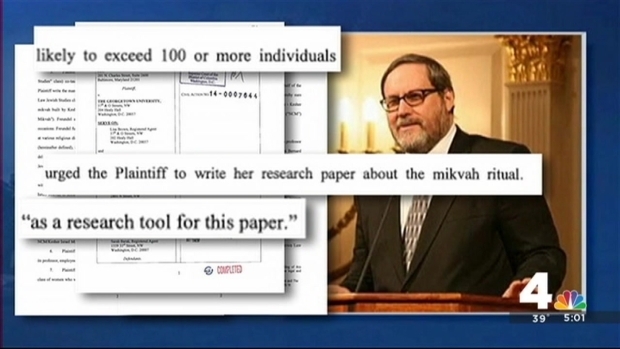 The plaintiff says she was taking Rabbi Barry Freundel's Jewish studies class at Georgetown when he encouraged her to write her research paper on the mikvah ritual and told her to research it by participating in the immersion. The student got the highest grade in the class because of that paper but now feels she was lured by Freundel to be sexually exploited. "We are horrified by the behavior reported to have taken place at the mikvah," read a statement from the university. "The university is cooperating fully with law enforcement authorities on their investigation, as well as conducting our own investigation of Rabbi Freundel's conduct." A third-year Georgetown University law student only known as Jane Doe filed a class action lawsuit Tuesday afternoon against her school and the Georgetown Synagogue, which is where Rabbi Barry Freundel is accused of illegally videotaping women as they undressed and went into a ritual bath, known as a mikvah. Tisha Thompson reports. The lawsuit describes Freundel preparing the changing room and telling the plaintiff specifically where to put her clothing, where and how to shower, and what products to use in the shower when she participated in the ritual in early March and again in early April. Freundel is charged with six counts of voyeurism. He was arrested in October, when he was accused of recording at least several women at a ritual bath next to Kesher Israel. The class action lawsuit filed Tuesday claims at least 100 women may have been videotaped. A witness said Freundel installed a camera disguised as a digital clock radio in the showering and changing area of the National Capital Mikvah, and pointed the device at the shower. Freundel was the rabbi at the Kesher Israel Orthodox synagogue in Georgetown, which is affiliated with the mikvah. He was suspended from the synagogue after the allegations surfaced. 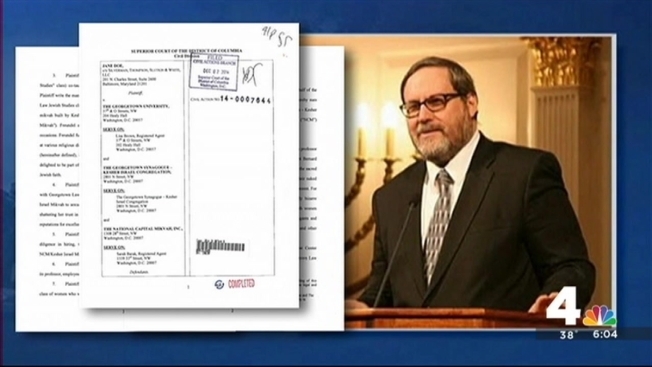 The lawsuit claims Georgetown, Kesher Israel and the National Capital Mikvah ignored warning signs about Freundel. Officials at Kesher Israel announced Monday that they terminated Freundel's contract last week. He has been asked to vacate the rabbinic residence by Jan. 1. The National Capital Mikvah (NCM) has also terminated Freundel as the mikvah's supervising rabbi.Detectives have been reviewing about 10 years' worth of video seized from Freundel's home and computers in an attempt to identify additional potential victims. Women who are worried they may be victims have been told to submit a photograph to detectives. Other possible victims can contact the U.S. Attorney's Office. Freundel was charged after another woman, Emma Shulevitz, reported her fears that she had been caught on camera and went public. Freundel is due for a court hearing Jan. 16. He has pleaded not guilty to voyeurism. Since his arrest, police found additional micro cameras hidden inside regular objects, including a tissue box and a clock at his office at Towson University, where he taught classes. Police also found hard drives, memory cards and a handwritten list of names.